Second, on the rules(! 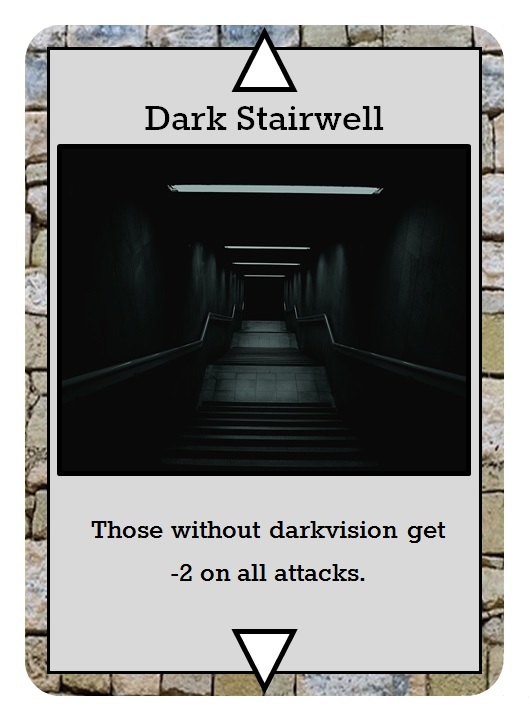 ): Dungeonstack is based on my experiments with The Stack Hack, a solo, card-based dungeon crawl modeled on The Black Hack's rules. With apologies to anyone who might be disappointed by my abandoning TBH as a base (although really, you'll be able to play things just about as easily using David Black's excellent ruleset), I'm switching things up to make the game more generally OSR-accessible (with special nods to the simpler versions of Swords & Wizardry). In a nutshell, when a hero moves into a new room (with possible directions indicated by the arrows on the cards), cards are turned over from the top of the Dungeonstack (deck) until a room card is revealed. Any items turned over can be found in the room. Any monsters are there for an encounter. And...as I'll get to in the next couple of days...any events take place immediately. A quick aside: One of the main reasons I settled on "Dungeonstack: April's Quest" for my A to Z topic, rather than "Henchmen & Hirelings: The Quest of Atoz," is that among my card game ideas, this one lends itself really well to solo playtesting. Since, for the most part (and while I'd like to develop some competitive rules), it's about solo play, after all! I'd like to think this will help me actually produce something complete and worthwhile in the long run...! And finally...you may notice that "darkvision" is mentioned in the rules text for the Dark Stairwell. That's connected to the fact that a convention of Dungeonstack is that all rooms are assumed to be sufficiently lit...except in cases like this. Overall, that seemed like a simple enough allowance to eliminate a fair amount of rules complexity and tedium in what will hopefully be a quick-playing game. So, there we are...a room! I hope you'll join me tomorrow when I fit another very simple item into the 'stack...! I really like seeing the evolution of this game as your presenting. Thanks man! I'm really enjoying the feeling that something might be coming together!